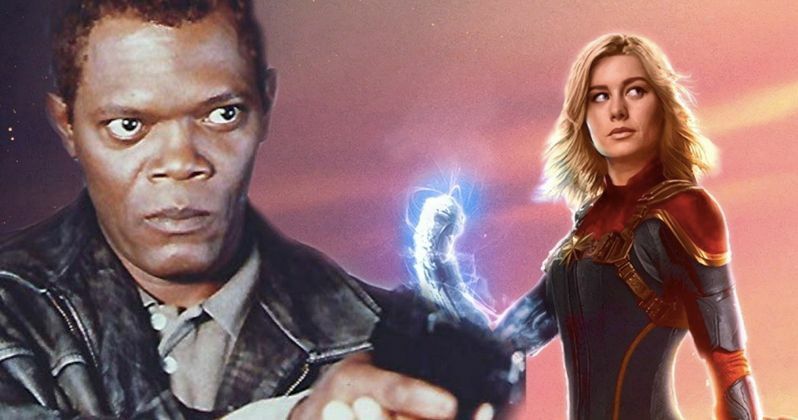 Marvel Studios boss Kevin Feige recently revealed that Samuel L. Jackson's Nick Fury will be digitally de-aged throughout the entire Captain Marvel movie. The next Marvel Cinematic Universe project stars Brie Larson as Carol Danvers and will hit theaters in March of next year, taking place in the early 1990s, which will feature a young version of Nick Fury with two working eyes. Feige also stated that Fury will be taken back to look 25 years younger than he was when he turned to dust after Infinity War. Many believed that Samuel L. Jackson would be de-aged throughout portions of Captain Marvel, but it appears that he will have a much larger role than anticipated. Digital de-aging was recently used in Ant-Man and the Wasp for Hank Pym during flashback scenes, but this will be a rare occasion that it is used all the way through. Kevin Feige had this to say. "Well, I think having the option is pretty amazing. And I think having the technology and even without spoiling anything, Sam Jackson is shooting a movie for us right now that takes, where he's entirely 25 years younger the whole movie." Kevin Feige noted that Clark Gregg's Agent Coulson will also be digitally de-aged as well. Samuel L. Jackson was spotted on the set of Captain Marvel with the motion capture dots on his face that will be used to de-age him in the post-production phase. It's believed that Marvel Studios likes to apply digital effects while filming to get a feel for how everything looks during the dailies, but the post-production time will allow for a better overall look and feel of the special effects. Digital de-aging has come a long way since 2008's The Curious Case of Benjamin Button and the MCU has been using it to great effect lately. We've seen the de-aging technique used with Michael Douglas' Hank Pym in Ant-Man and the Wasp, Robert Downey Jr.'s Tony Stark in Captain America: Civil War, and the previously mentioned Kurt Russell in Guardians of the Galaxy 2. Each time, the technology has gotten better and better, which means that Captain Marvel will feature a pretty awesome version of Samuel L. Jackson's young Nick Fury. Captain Marvel just wrapped filming yesterday and is entering into the post-production phase of the project. There's going to be a lot of special effects used in the film, which will be the very best that there is to offer, so Samuel L. Jackson and Clark Gregg should look pretty damn good. It also helps that both actors do not look as old as they are in real-life. Not many know that Jackson is 69-years old, so he's already got a head start on the de-aging process. You can read the rest of the interview with Kevin Feige where he discusses the digital de-aging technique further at Slash Film.